These economical brush sets have clear acrylic handles that won't crack or peel, even when left in water! 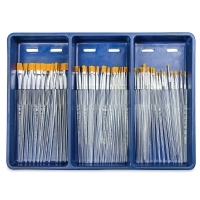 Available in both short handle and long handle styles, Royal & Langnickel Clear Choice Brush Sets offer synthetic filament brushes for a variety of applications and techniques. 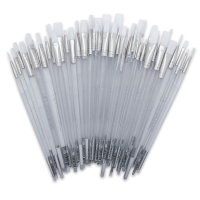 They're ideal for classroom settings. 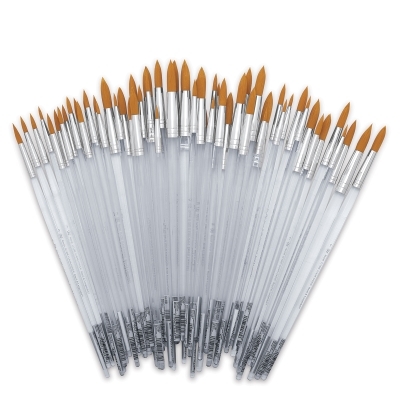 Choose Gold Taklon for acrylics, tempera, and gouache; and White Taklon for acrylics and oils. Every brush has a clear acrylic handle and an aluminum ferrule for durability and easy cleaning. 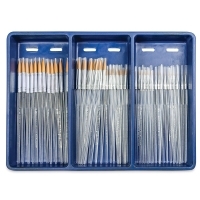 Every set includes a divided plastic tray with drain holes in the bottom for drying the brushes flat. The tray doubles as a storage tray. Golden Taklon, Set of 60 Flats, Long Handle — This set includes 12 each of Size 1, 3, 5, 7, and 9 Flats. White Taklon, Set of 60 Flats, Long Handle — This set includes 12 each of Size 1, 3, 5, 7, and 9 Flats. Golden Taklon, Set of 60 Round, Long Handle — This set includes 12 each of Size 1, 3, 5, 7, and 9 Rounds. 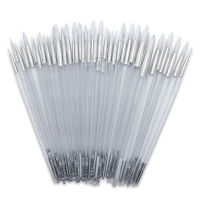 White Taklon, Set of 60 Rounds, Long Handle — This set includes 12 each of Size 1, 3, 5, 7, and 9 Rounds. Golden Taklon, Set of 60 Flats, Short Handle — This set includes 12 each of Size 2, 4, 6, 8, and 12 Flats. Golden Taklon, Set of 60 Round, Short Handle — This set includes 12 each of Size 5/0, 0, 3, 8, and 12 Rounds. Short Handle. 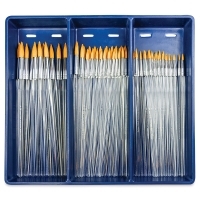 Golden Taklon, Set of 144, Short Handle — This set of 144 brushes contains 12 each of Size 4, 8, and 12 Shader; Sizes 20/0, 3/0, 1, 3, 5, 8, 10 Round; and Sizes ½" and ¾" Flat. ® Royal & Langnickel is a registered trademark.™ Clear Choice is a trademark.